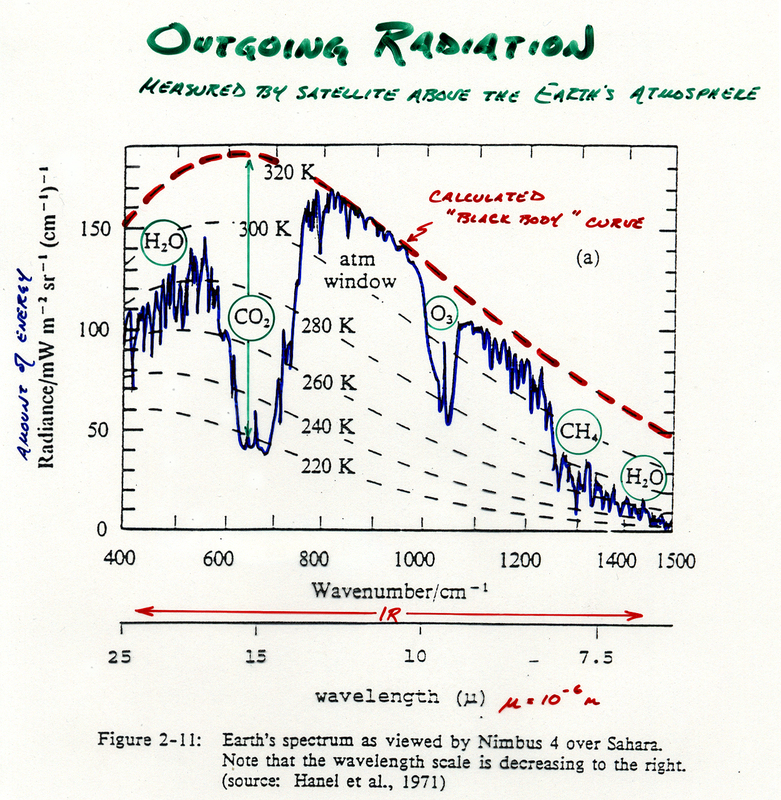 The Arrhenius greenhouse effect falsely assumes radiation from a cold "blackbody" emitter of radiation can warm or increase the energy content of a warmer "blackbody," in essence that a "blackbody" [CO2] emitting 15 micron radiation at a corresponding blackbody temperature of 193K [-80C] can warm a much warmer blackbody at 255K (-18C) by 33K up to 288K (15C), the temperature of the Earth surface. However, Planck’s Law and the theory of blackbody radiation proves why this does not spontaneously occur in nature, and why the Maxwell/Clausius/Carnot/Boltzmann/Feynmann/US Std Atmosphere gravito-thermal greenhouse theory is the only physically correct greenhouse theory. 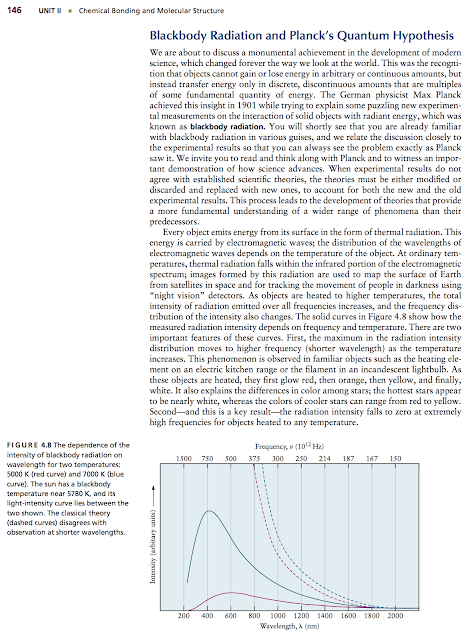 Planck’s Law and the theory of blackbody radiation proves why low frequency/energy photons (eg 15um photons from CO2) cannot transfer any quantum energy to a higher frequency/energy/temperature blackbody because all of those lower frequency/energy microstates & orbitals are already completely filled or saturated in the hotter body. This fact alone from quantum mechanics falsifies CAGW. Even though CO2 has emissivity less than a true blackbody and line emissions centered around 15um, and observations also show CO2 emissivity decreases with temperature unlike a true blackbody, for purposes of this simple question, we’ll assume (like climate scientists incorrectly do) that CO2 emits and absorbs as a true blackbody. Can a blackbody at 217K cause a blackbody at 255K to warm by 33K to 288K as the Arrhenius theory claims? No, this is absolutely forbidden by the second law of thermodynamics on both a macro and quantum/micro basis (see Chapter 13 linked here). The lower energy/temperature/frequency microstates of a blackbody at a given temperature are by definition “saturated” in a perfect blackbody absorber/emitter and that explains why classical physics shown by the dashed lines in fig 4.8 does not occur in nature and instead a Planck curve of emission and absorption is found in nature. If those lower energy/temperature/frequency microstates of a blackbody were not saturated, then any energy level photons could be thermalized by a blackbody and the frequency vs. blackbody energy intensity curve would go to infinity as shown by the (false) dashed lines in fig 4.8. Also note, the dashed red & blue lines of the false blackbody in fig 4.8 are at higher intensity levels for each given frequency than that predicted by Planck's law. This demonstrates as well that lower frequency/energy photons cannot warm a blackbody at higher frequency/energy/temperature and that heat transfer is one-way only from hot to cold blackbodies (despite the fact that radiation between them is bidirectional). "Planck's Law proves why radiation from a cold object cannot warm or increase the energy of a warmer object"
I'm bewildered by the assumption of almost anybody claiming radiation of a colder object **warming** a warmer object. What has been said: the increased back-radiation is supposed to reduce the speed at which the warm object (surface) succeeds to cool down. I really don't understand why you keep touting this. It is as if you think "warming" as in "raising temperature" and not as comparatively between "cools a lot" and "cools less". Less cooling is not same as more warming, but only if you think very literally. Would you like us to talk about global less-cooling? That would be more precise, but of course, after some less-cooling the temperatures prolly end up higher and we could talk about warming. You say "I really don't understand why you keep touting this." I think that's because you don't really understand quantum mechanics, or perhaps even classical thermodynamics. At the quantum level, the relatively colder CO2 molecule cannot warm the warmer earth. At the macro level we see that heat cannot spontaneously flow from a colder to warmer body. The thing you describe is not consistent with either. "At the quantum level, the relatively colder CO2 molecule cannot warm the warmer earth"
Yes, it is not even supposed to "warm" the warmer Earth. It is not *warming* the earth. No-one (who knows physics) says it is warming the Earth per se. CO2 reduces the speed at which the Earth cools down. It does not raise the temps, it just does not let them drop as fast, which effectively makes the surface less cool, i.e. warmer. What is your point? I'm really curious, how can you go on? Oh yes "they" do say it the "backradiation" from the -18C atmosphere is warming the earth from the -18C equilibrium temperature with the Sun to the current surface temperature of 15C. "They" have confused the cause (gravito-thermal GHE) with the effect (IR radiation from GHGs). GHGs only delay IR by a few milliseconds on its passage to space, easily reversed at night for no net warming effect. Thanks again for answering and not being trolled. No, the backradiation is not actively warming the ground, it is leaving it warmer by preventing cooling. The Sun does the real warming job - mostly at least. But relativitely one could think backradiation warms the ground - it is just a relative, and non-thermodynamical expression then. Strictly not true. Now the second thing, what happens to radiation which points down and comes from a colder object. Surely it does not evaporate into thin air, but frankly the quantum mechnanical treatment of that is fairly complex -- far too complex for me. If I got it right, you claim it is completely reflected, because the ground can't take it. I think that won't be that simple, but unfortunately I will be unable to show that mathematically. Thanks for clearing out your thinking. You need to make it even clearer, otherwise technically oriented people like me who can't really put a finger on where the error in my thinking or your thinking is, can't be convinced. Namedropping Clausius or something is not the trick, but rather to make it understandable in terms of gedankenexperiments. People like you, in the history of controversial physics, are sometimes right, even not believed right away. What you need is convincing logic and patience. If you are right, there is no reason to be impatient. One could 'square the circle' by accepting that GHGs absorb energy which slows the rate of radiative cooling but that lapse rate slopes and the pattern of convective overturning change to negate the thermal effect of GHGs. Thus the surface temperature dictated by the mass / gravity scenario is maintained despite radiative capability within the atmosphere. In essence the result is the same, if convection dominates radiative-convective equilibrium, and it does by a wide margin, any increase in "radiative forcing" is easily negated and erased by increased convection (& evaporation). I will add some additional detail in relation to events at the tropopause and the surface and let you see it shortly. It is all basic meteorology but that is a highly specialised discipline which has been completely ignored by the AGW proponents and many sceptics. I think the cold body can not warm a warm body argument holds for anything that would be characterized as a closed system. Put ice next to a glass of water in a sealed box, the water will certainly not boil. Issue is, Earth plus atmosphere is an open system with sun pumping energy into the system and atmosphere is like a blanket. So better analogy is I feel cold, I put on a blanket, my body is generating heat and blanket traps it, I feel warmer. I am sure using a blanket to warm myself did not violate 2nd law of thermodynamics. The atmosphere is not a "blanket." Blankets, greenhouses, insulation in the attic etc. all work by limiting convection. In fact, GHGs accelerate convection by preferentially transferring heat via collisions with N2/O2 rather than emitting a photon. "by preferentially transferring heat via collisions with N2/O2 rather than emitting a photon. " That is the critical point . As density increases with depth through an atmosphere collisional transfers of energy increase at the expense of photon emission so that at Earth's surface one needs a temperature of 288K to get enough photon emission past the mass of the atmosphere to radiate to space at 255K. The radiative theory incorrectly ignores the reduction in photon emission rates that occurs with an increase in collisional activity. That error leads them to the false assumption that a surface at 288k must nevertheless radiate photons at a rate commensurate with a temperature of 288k. Instead, the amount of collisional activity at Earth's surface absorbs 33K of surface energy so that it cannot radiate out to space from the surface. The surface is not exchanging radiative energy with the atmosphere at all. Instead it is exchanging kinetic energy to and fro between ityself and the mass of the atmosphere via conduction and convection creating potential energy within the atmosphere to produce the mass induced greenhouse effect via the gravito / thermal mechanism. Due to the false assumption that the surface 'should' be radiating photons commensurate with a temperature of 288K they then need to invent a radiative flux from atmosphere to surface to balance the energy budget. They really don't need that downward radiative flux at all because the necessary kinetic energy to support the extra 33K at the surface is coming from PE converted to KE in descending air which is half the atmosphere at any given moment. Yes agreed, the IR from the 288K surface becomes "degraded heat" in the 255K atmosphere with increased entropy, which cannot be "put back in the bottle" to re-heat the surface as Trenberth's faux energy budget shows. What is it you want to prove? The Earth is warmed by the power from the Sun, and looses less power when the heat transfer is slowed down because of a close body at more than 0K. Or by the radiation from that body assuming the same outgoing radiation from Earth as for the 0K case. The earth is warmed by the Sun, the Sun inflates the atmosphere to create the gravito-thermal GHE, and which has nothing to do with the concentration of trace CO2. CAGW falsified. As stated above, GHGs only delay IR by a few milliseconds on its passage to space, easily reversed at night for no net warming effect. The sun inflates the atmosphere commensurate with the surface temperature of 255K. Uneven surface heating then sets up density variations in the horizontal plane which then sets off convective overturning. That overturning requires energy to maintain the motion first against gravity in ascent and then with gravity in descent. The necessary energy to keep that motion running for as long as there is an atmosphere is the 'extra' 33K at the surface which is comprised of PE being reconverted to KE in descending columns and is being redelivered towards the surface in addition to continuing insolation. Nothing to do with radiative gases. I think I'm late to this rodeo, because I don't fully understand the premise: while I understand the underlying thermodynamic argument, isn't the primary assumption of CO2 as an effective GHG reside primarily in positive feedbacks, namely H2O(g)--though this isn't demonstrated other than assumed by models. I'm simply asking for clarity for the relative terms in the article--when you refer to the 'warmer blackbody' do you mean the atmosphere? Or the Earth's surface? Or other GHG, of which water vapour comprises 95%? Secondly, where do the numbers 255K and 288K come from? While I agree a cold body can't warm a warm body (not that my agreement is required), shouldn't the temperatures (and pressures) be the same as both "bodies" occur in the 'system'. Thus we're talking about heat put into the system to warm both bodies, in which case one aliquot of CO2 would warm more rapidly given it's inherent lower heat capacity compared to H2O (about 5x lower) at a given isotherm. However, the effect would be mitigated by concentrations orders of magnitude less than H2O concentrations (very low partial pressures among the sum of pp in a large volume). Most of the GHG effect of H2O(g), therefore is from direct heat put into the system, not feedbacks since the effect due to (low) concentration of CO2 in the overall system is negligible to nil. ~217K emitting temperature of the CO2 + H2O "partial blackbody"
A blackbody at an emitting temperature of ~217K cannot warm/increase temperature/energy/frequency of a blackbody at either 255K or 288K, or any temperature > 217K. I agree with the point made above in that if convection dominates and takes over radiative-convective equilibrium by a wide margin or large degree, any increase in radiative forcing is erased by increased convection. Very interesting article!